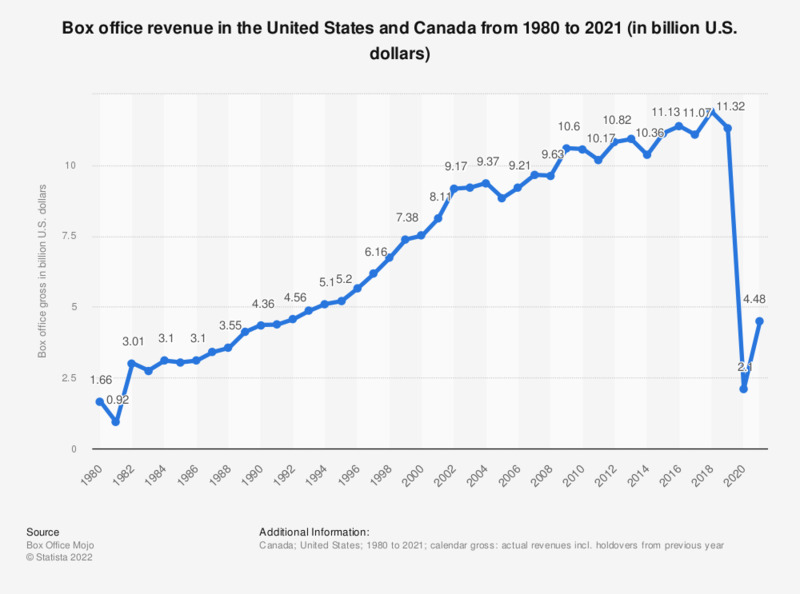 The statistic above presents data on the annual box office gross revenue in the US and Canada. In 2018, 11.89 billion US dollars was earned at the box office. The film industry uses box office revenue, or, the amount of money generated through movie ticket sales, to measure the commercial success of the films it produces. Ticket sales also account for a sizable portion of the film industry’s total revenues. Over 1.3 billion tickets were sold at the North American box office in 2018. The average ticket price was 9.14 dollars, marking an increase of almost two dollars since 2008. Box office revenues in 2018 were dispersed among a number of leading film studios in North America. Buena Vista earned the most at the box office in 2018, generating over three billion U.S. dollars in ticket sales. Buena Vista had a box office market share of 26 percent that year, up from 21.8 percent the previous year. Warner Bros. took the second largest portion of box office revenue in 2018, with earnings totaling 1.9 billion U.S. dollars. Warner Bros. accounted for 16.3 percent of the box office market in 2018, down from 18.4 percent in 2017. Other leading film studios in terms of box office revenue included: Universal, 20th Century Fox, Paramount, Lionsgate, and Sony/Colombia . In 2018, the highest grossing movie in North America in 2016 was “Black Panther" distributed by Walt Disney Studios Motion Pictures, with over 700 million U.S. dollars generated. Second highest grossing in 2018 was “Avengrers: Infinity War,” also a Marvel/Walt Disney production.